It’s important to know when to start brushing baby’s teeth. After all, good oral care from birth leads to a lifetime of healthy teeth and gums. Read on to find out if you use a special toothbrush, when to use toothpaste, and if you even floss. Baby tooth care actually begins even before the teeth make an appearance — the first tooth usually shows up somewhere around 4 to 7 months, although some babies don’t get teeth until later. You should start gently wiping baby’s gums after feedings and before bedtime with a piece of gauze and start brushing with a soft toothbrush as soon as the first teeth sprout. When should I introduce toothpaste? Following the recommendation of the American Dental Association, you should start brushing with fluoride toothpaste about the size of a grain of rice as soon as your baby’s teeth sprout. When your child can spit (at about age 3), increase the amount of toothpaste to about the size of a pea. Be sure to supervise your kids until they’re about 5- to 6-years-old to make sure they use the right amount — not so much that the toothbrush looks like a frosted lollipop. Why is tooth care for baby teeth so important? 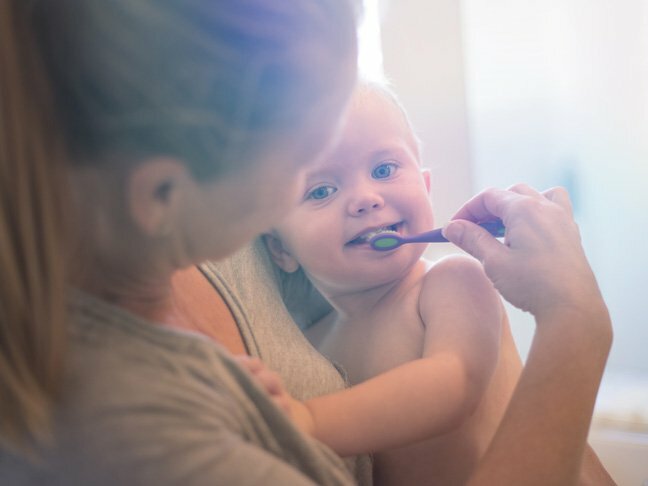 Even though they will fall out, it’s important to know when to start brushing baby’s teeth because healthy little teeth help pave the way for healthy big-kid teeth later on. Baby teeth act as placeholders for the adult teeth, so it’s important to keep them healthy. Absolutely. Just like not every parent knows when to start brushing baby’s teeth, not everyone knows that babies get cavities. Unfortunately, about 50 percent of children will have some form of tooth decay before age 5. To prevent cavities, avoid needless sugar. Babies shouldn’t have sugary drinks, such as soda (yikes) or even juice, in their bottles when they’re awake and definitely not when they go to sleep. How else can I care for my baby’s teeth? One cause of infant cavities is baby bottle tooth decay. This condition usually affects front teeth and is caused by long-term exposure to sugar — when the baby is put to bed with a bottle. Use only water in a night bottle and never dip pacifiers in sugar or honey. It’s important to know when to start brushing baby’s teeth, but you can turn brushing into a fun game. Later, when they’re older, they can pick their own special toothbrush, and you’ll know you’ve helped them create healthy habits. That’s something to smile about!